3 What is Mppt ( Maximum power point tracking)? 4 How MPPT works? Why 150W solar panel does not equal to 150 w? For maximizing a photovoltaic (PV) power, continuously tracking the maximum power point (MPP) of the system is highly required. MPP of the PV system depends on solar radiation conditions, ambient temperature, and the load demand. Maximum power point tracking (MPPT) techniques can catch MPP of PV system. Such techniques can be realized in many various forms of hardware and software. The goal of this project was to develop, construct, and test a working solution to the MPP problem with a limited budget. 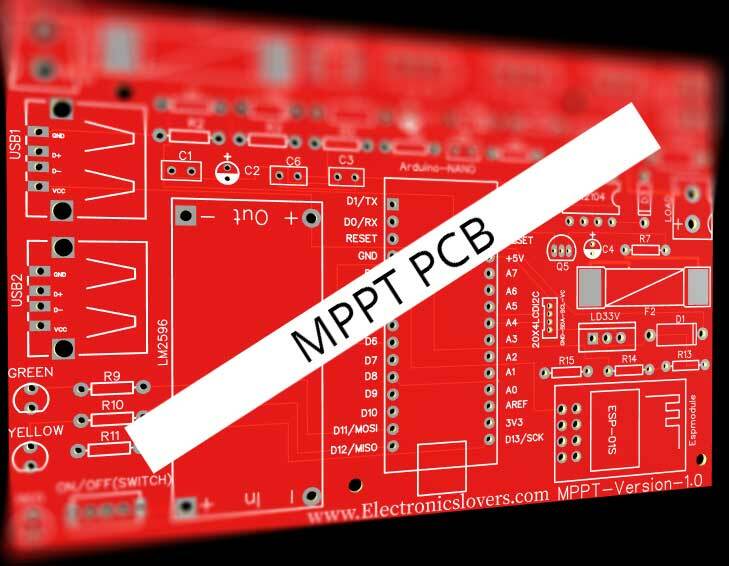 This tutorial Contains the general circuit of MPPT, the panel cell and it is a formula, about how MPPT works, the required parts and sub-circuit. 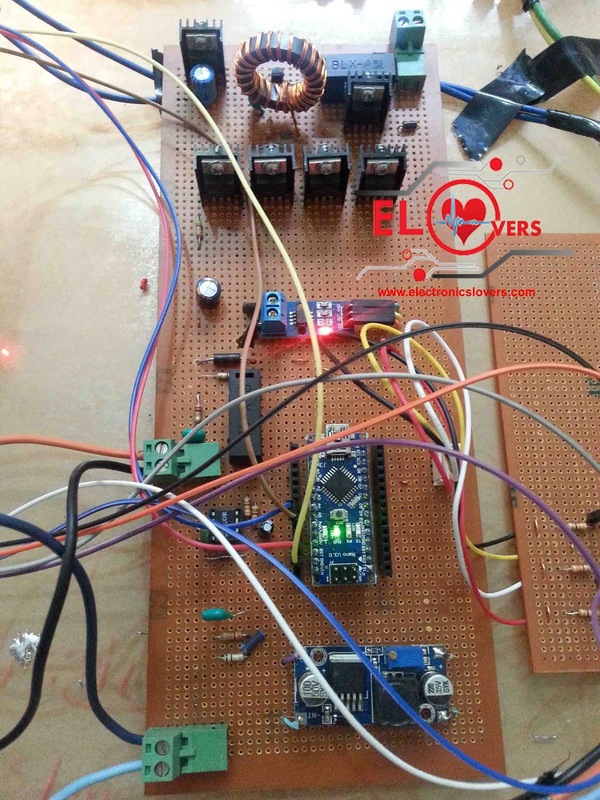 we choose buck converter in our project and explained how to use Arduino and how to apply it in Proteus. What is Mppt ( Maximum power point tracking)? We use MPPT algorithm to Extract the maximum available power from the Photovoltaic module under certain conditions. 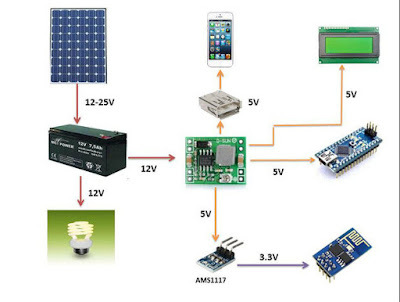 MPPT is a Most Popular tool that helps us to use Solar Energy (Renewable Energy Source) in an efficient way. If we want to Reduce the Graph of Carbon footprints then we must need to move towards clean Energy which is called Renewable Energy ( Energy we can get from Natural resources) Like SOLAR, HYDRO, WIND e.t.c otherwise we will directly move toward Global Warming. Every Country needs to Move towards the Green Energy especially CHINA because it is the Main contributor by producing 63% Co2 | Alternative energy. How MPPT works? Why 150W solar panel does not equal to 150 w? For example, you bought a new solar panel from the market which can deliver 7 amps current, under charge the setting of a battery is configured to 12 volts: 7 amps times 12 volts = 84w (P=V*I) You lost over 66 watts – but you paid for 150 watts. That 66 watt is not going anywhere, but it,s due to the poor match of the solar output current and battery voltage. After using MPPT algorithm we can get the Maximum available power Battery gets is now 12 amps at 12 volts Output power is equal to p= V*I p=12*12=144w Now you still have almost 144 watts, and everyone is happy. Remember: Make a New Folder ( Folder name should be same as library names like TimerOne and LiquidCrystal_I2C. Paste these Two Folders in Arduino/LIbrary. Once all inputs are read, it calculates the current power supplied by the PV panel by multiplying read voltage by reading current. 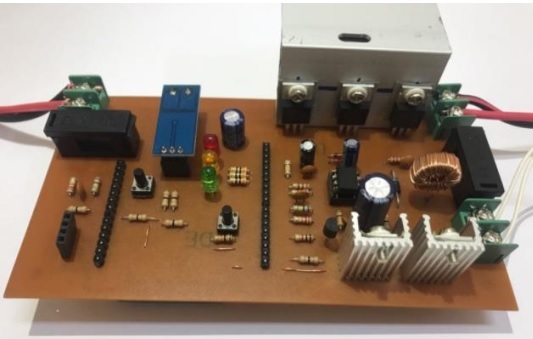 If the supplied PV power is low and the battery is not fully charged, the charging state is set to ON, the MOSFET driver is enabled, and the PWM rate is set to 100%. If the supplied PV power is medium to high, and the battery level is not fully charged, the charging state is set to Bulk, the MOSFET driver is enabled, and the PWM rate is set to 100%. If the supplied PV power is medium to high, and the battery level is fully charged, the charging state is set to Float, the MOSFET driver is enabled, and the PWM rate is set to Maximum. If it is night time and the battery voltage level is higher than the “Low Voltage Disconnect” threshold which is 11.9V, the output is enabled and the battery supplies its energy to the load. If the battery voltage level gets below the “Low Voltage Disconnect” threshold which is 11.9V, the output gets disabled and the load gets disconnected. If the battery voltage level is lower than 11.9V, then the RED Led is turned on. If the battery voltage level is higher than 11.9V but lower than 14.1V, then the GREEN Led is turned on. If the battery voltage level is higher than 14.1V, then the YELLOW Led is turned on. 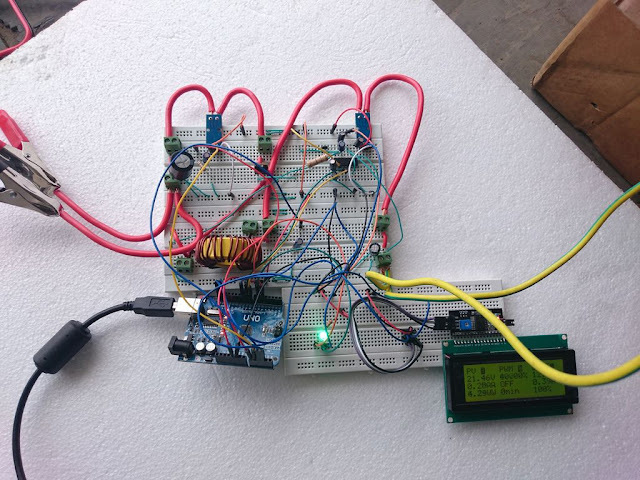 Next, the Arduino updates the information displayed on the LCD screen according to the above processes and then starts another reading of the inputs to start the loop phase process once again, and then it continuously repeats this loop over and over. This Simulation has been designed in Proteus Software 8.6 version. You can make your own by using Arduino Library for Proteus and a simulation tool known as Proteus. Section A: is the input of the system which is the power supplied by the solar panel. The fuse F1 and TVSs represent the protection network against any high current that could happen to the circuit. The Voltage divider network (R1, and R2) are used to scale down the voltage provided by the solar panel (VPV) so that the maximum voltage supplied to the Arduino analog input (A0) doesn’t exceed it the maximum voltage limit which is 5V. The output voltage of the voltage divides is one-sixth (16) of the input voltage. So the maximum value for the PV panel voltage should not exceed 30V. Section B: is the current sensing network for the power supplied by the PV panel. The ACS712-5 is a hall-effect current sensor chip whose output is an analog signal proportional to the current passing through the chip. The capacitor is a general filter capacitor. The output of the current sensor is connected to the second analog pin of the Arduino (A1). Section C: represent a blocking circuit that allows the current to flow in only one direction which is from the PV panel to the charging circuit. 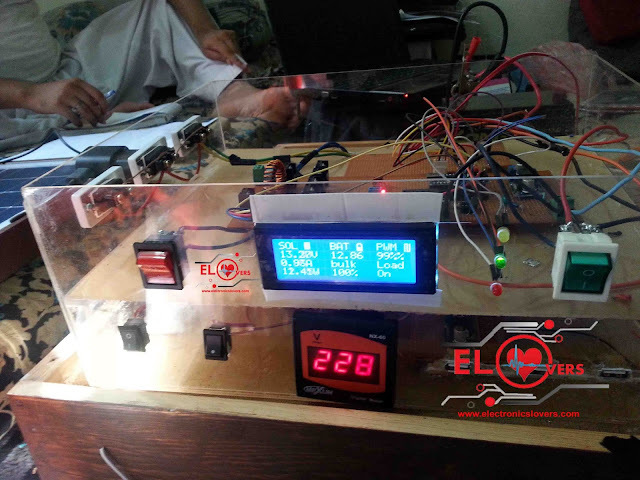 The aim of this circuit is to protect the PV panel from the battery voltage when the solar panel is not producing electricity. The MOSFET transistor Q1 gate pin is connected to the MOSFET driver chip (IR2104) through the diode D3. So that Q1 is engaged only when the MOSFET transistors are operational. Section D: is the charging network. The MOSFET driver chip will control the MOSFET pair Q2 and Q3 in a push-pull configuration to enable the current to flow inside the coil. The output of this network is connected to the battery to be charged. Section E: is another voltage divider connected to the third analog pin (A2) of the Arduino. This network feed the voltage of the battery into the Arduino to measure it. responsible for allowing/ block the current to flow from the battery to the load. Whenever D6 is low (0V), the base of Q5 will be high, and the MOSFET Q4 will be passing the current. When D6 switch its state to High, (5V), the base of Q5 will be High, and the MOSFET Q4 will be open circuit and the current flow will be blocked. 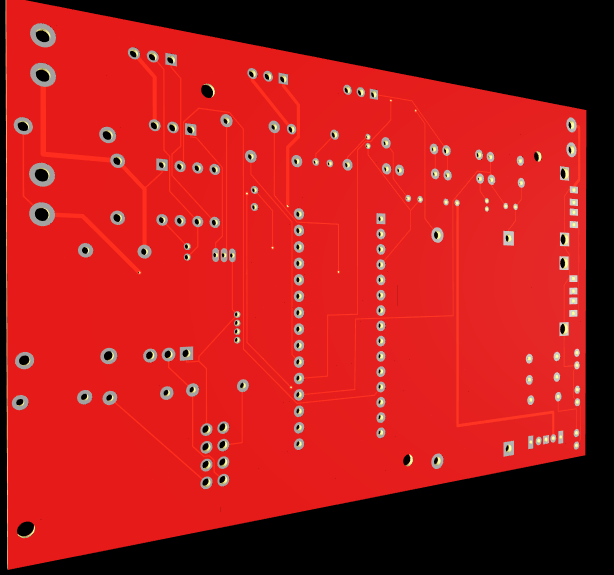 Section G: is the Push-Pull MOSFET network driver. It drives the MOSFET transistors Q2 and Q3 based on the signals generated by the Arduino board at pins D8 and D9. Section H: is the voltage regulator circuit responsible of supplying the Arduino with the rated voltage (5V). The input to the regulator is the battery. 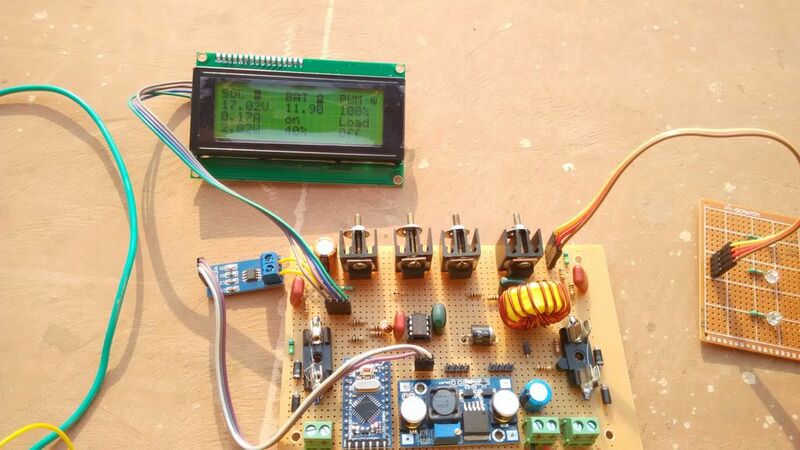 The output of the regulator are mainly the Arduino board and the LCD display. Section I: is the serial LCD display. 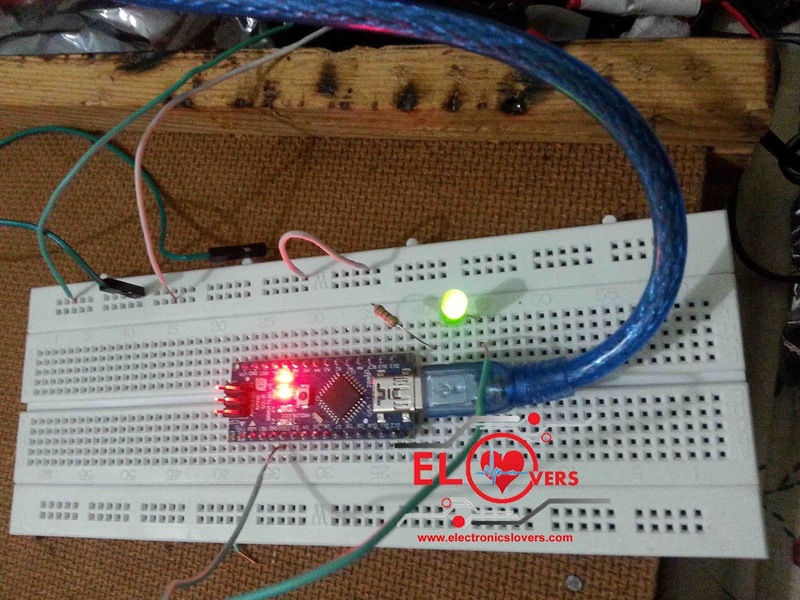 It uses the I2C protocol to communicate with the Arduino Board. Section J: is the visual indication LED used to state the voltage level of the battery. The resistors R11, R12, R13 are current limiting resistors used to prevent the voltage supplied by the Arduino (5V) from damaging the LED which requires only 2 volts to operate. After Reading The Above article I am assuming that you have successfully connected your ESP8266 module to your Wifi. 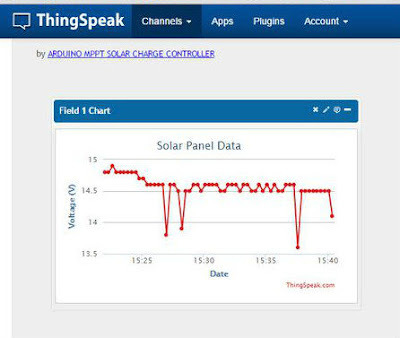 Make a New Channel and write “Solar Panel Data” in Field 1 and leave other fields blanks and save it. You will Get API key, Copy that Api Key and Paste in Source Code. What would be the pitfalls of trying to run multiples of these in parallel. I'm thinking a system with multiple panels/controllers charging a single battery bank. Much like a system with multiple panels and multiple inverters (like the enphase micro-inverter) running in parallel. Can I use another arduino controller like arduino mega2560 instead of arduino Nano? Can I use another arduino controller like arduino mega2560 inesNice project! Can I use another arduino controller like arduino mega2560 instead of arfuino Nanoted to arduino Nano? Is it possible to incorporate an external AC charger in case of insufficient sunlight for several days? Yes indeed..When the panel is producing enough current, AC charger will be disconnect and the solar panel will charge a battery. just transister place in parrallel no other circutiry changes ? hi.hope you are well.will you please tell me that is it works with boost convertor?will it be efficient system as in low insolation conditions the voltage may be very low.please guide me about this. hi. i have project i am working on it. it is only about to get the power from solar and then apply MPPT algorithm using Buck. i just want output source with MPPT without battery charging . Is your code helpful for me or i have to apply new code or my case . waqas bhai please app apna question sahi bata dae app ka matlab hai k Market main LCD nai mil rahi am i right ??? LCD with module is available at "IC MASTER" shop located at college road go there and buy for your self ………other wise you can change the program and connect lcd without module but i would be a little bit difficult. i have never used atemage8 if you are using so you must need to update each and every Out/in pins declaration in code …. 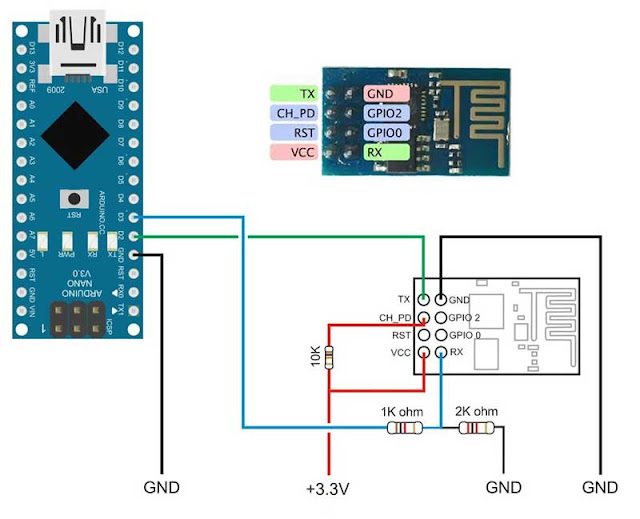 buck boost is best option otherwise you can use Boost also ..
from the schematic the buck converter connector output pin is connected at 5V arduino pin. is suppose to be connected there or Vin arduino pin? thanks for the clarification. i notice from picture you posted that there is two(2) extra mosfet is being used..can you show the exact circuit. 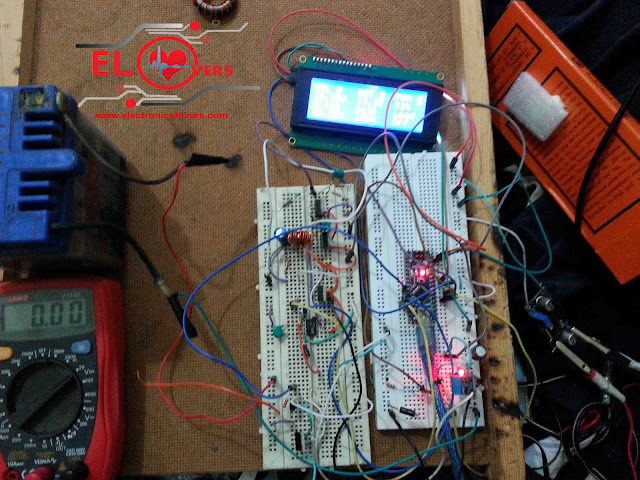 Good day I connected the circuit as on the schematic, but when I add the battery to the project, it keep on burning the 3rd MOSFET the one connected to pin 5 of the mosfet driver. any idea on what might be the cause please. Powering the MOSFET driver IR2104 from battery terminal ( 12V ) instead of solar panel ( earlier ). If anyone making this controller, make this changes and test it. If you have any test results / suggestions, comments it below. Salam, please can you give us your email ? How can we convert this 12v MPPT charge controller to 24v,36v and 48v? 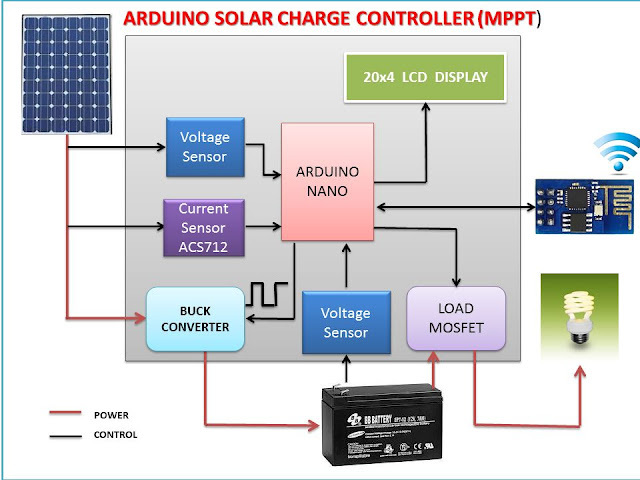 I have a local made MPPT solar charge controller attach with 24v solar panels its working very good since 2 years. Now i want switch on to 36v / 48v. how much is the total cost of this project? 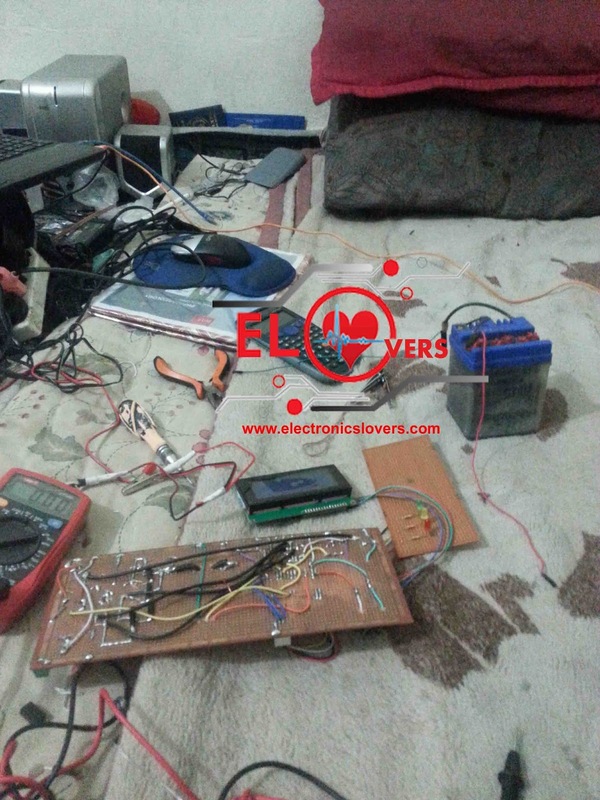 Have you plans to use it with 24V system and more amperes? Please send me your email address . i want to discuss about mppt . I want your project schematic . please send it at my email it is very urgently it is my final year project. What is all the changes to hardware and software? Sir I want to work on different algorithms of MPPT. Comparison of three algorithms. should I use Arduino or Simulink? can i wearing for battery 24 volt in your project ? Is it PSIM or PSPICE ??? because im making a project on solar panel charging mobile phone like a solar power bank. brother i sent you an Email please check it out and please reply!!! Is it possible to do this setup with 6v battery and 0.6w 6v solarpanel 200-300mA? No you cant do that by using this schematic, for this purpose you need to do some changes in schematic and arrangement of solar panel. What do u mean by complex details ? Which MPPT algorithm has been used in this code. Do you sell the projects ? a more complex details of the project do you have? i want to do a final project on my university and i really need some help,thank you! Nice Project!! Can I charge 24v batteries with solar panel at 40v-45v aprox? What type of MPPT for this project? Perturb and Observe, Inc.. or .. This is tested and verified project. Can i use this buck converter instead of the one you are using ? Can you tell me the difference between the circuit and your circuit ? As both circuits have some similarity and I am a bit lost. Also some of the pictures are not clear enough, what are you using three push switches for? hi thanks for your attempts to build a such an amazing design.i have a question.there is a similar project in instrucable site that the developer mentioned the problem that Q3 mosfet got so hot and suddenly burned.did you had the same issue in your schematic?and also i need a simulation flie of your project can you help me with that?thanks a lot and god bless you. Can I use arduino UNO? If so then what changes do I have to make in the code? if I remove WIFI Module is there any change in CODE? if I remove WIFI Module is there change in code? its optional, No need to change. Did You compile the code ? Is it error free ? 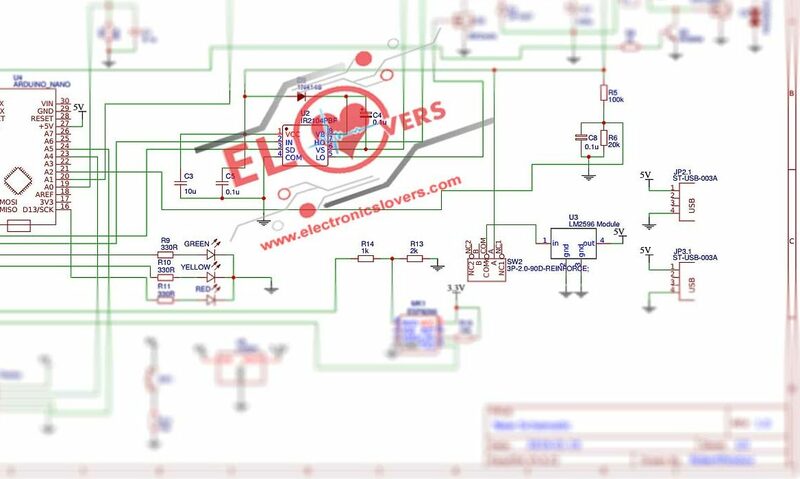 Have you download Schematic PDF correctly ? Yes i have used 6 Mosfet for better results + good efficiency. I placed Two extra Mosfet Transistors in Parallel with other ones, YOu need to use more Transistors in Parallel with Big size heat sink for higher capacity. Can you please clarify if this circuit can work for a 400 watt solar panel or not? Also can you please tell where did you place the two extra mosfets? I will donate if you help me. Do we need to change the code if we use 20watt solar panel and could you please send me the circuit diagram. No you don't need to change the code, Click on "DOWNLOAD Schematic Diagram" kindly read article carefully. 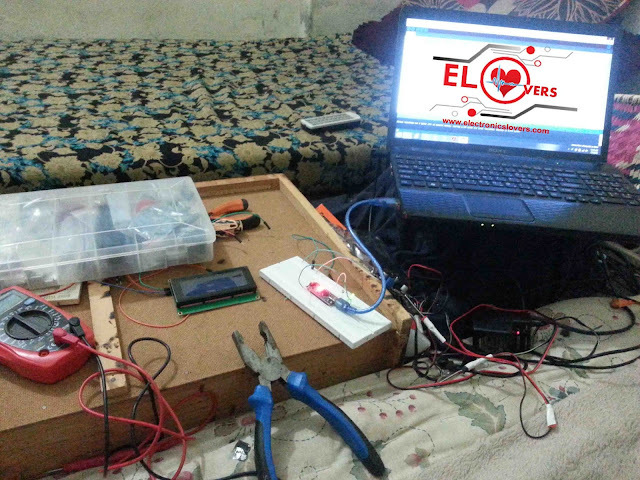 In instructables Deba168 said that mosfet is burning how to solve this problem sir? Here you have used 2 extra MOSFETS could how to tell the exact position of their connection. What’s up friends, nice post and pleasant urging commented at this place, I am genuinely enjoying by these. i planed to do this as an final year project. Just wondering if I already have a built up working buck boost converter. 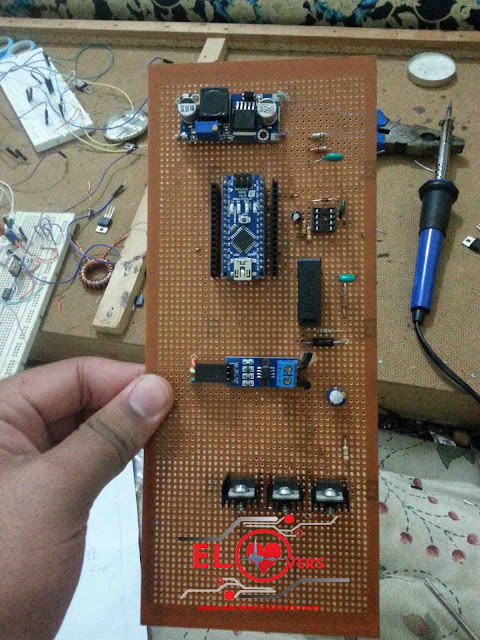 How should I go about integrating this project with buck boost converter? Is there any chance to improve the load and the charging current? irfz44 goes up to 50 amps properly cooled, also acs712 there’s a 30 A version. You can Improve its performance by adding more irfz44 in parallel with other ones. how much is the cost for this simulation? [SPICE] TRAN: Timestep too small; timestep = 1.25e-019: trouble with node #00040. Hi the arduino code for the project did not compile. I don’t know what the problem is. I got this error “positive not declared in this scope”. 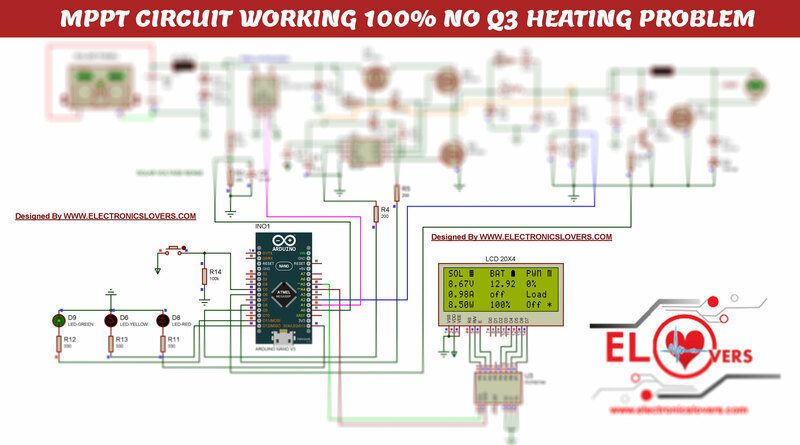 i want to make this circuit, but i read several comments about q3 burning, is this true? i wan to to make this circuit, but I’ve read several comments about Q3 burning, is this still a problem? I noticed that your simulation and actual products uses uno and nano respectively. Is there a difference if you used different types of arduino? CAN U HELP ME OUT OF THIS?? The sourde code is compiling perfectly well. What i did in my own case was that i download an earlier version of the arduino IDE i.e version 1.6.1. And thats it. try and see. ¿ Would it work using a 10 W solar panel ? 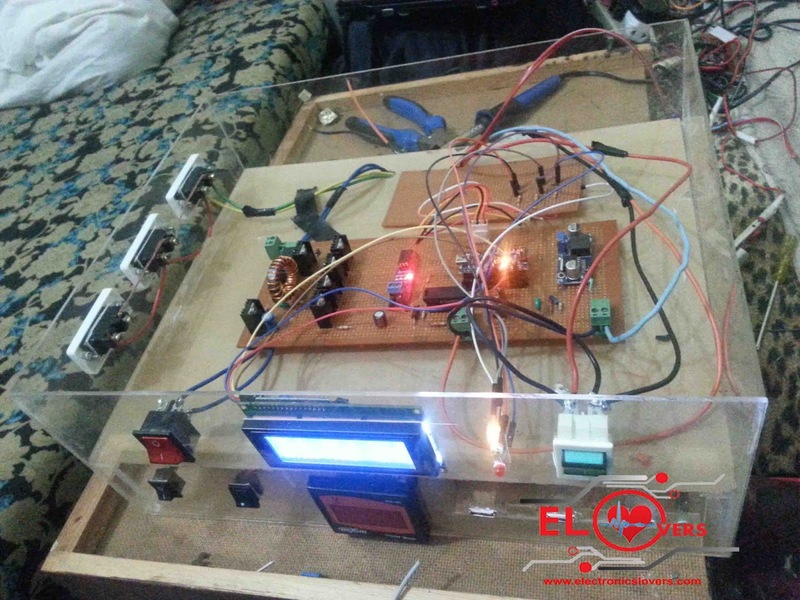 ¿ What changes do you think I need to do it in your schematic to get the proyect running ? I cant seem to download the code. Please contact me. Hello, I am looking to use a 2s LiFePo4 battery to charge each cell to 6.25 volts. The nominal voltage is 3.3 v/cell. Our solar array consists of 15 SunPower Maxeon solar cells, producing 8.175 v and 6 A at full sun. 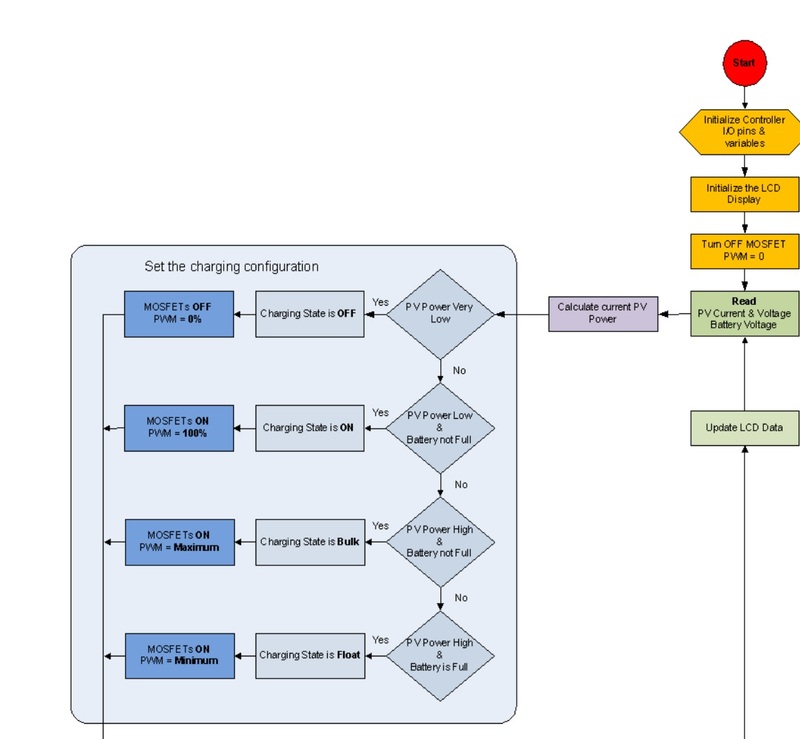 What changes will we need to make the MPPT charge controller and its code? Thank you. would it work using a 6.25 volt battery? hi Sir, can this simulation(proteus) get the charging algorithm. If can, how to get data analysis from charging algorithm. Will this work with a bench top power supply as input in stead of a solar panel? Hi there. Thank you for the great article. hi . when i have run this simulation in proteus . the lcd wont display . I have a couple of questions. 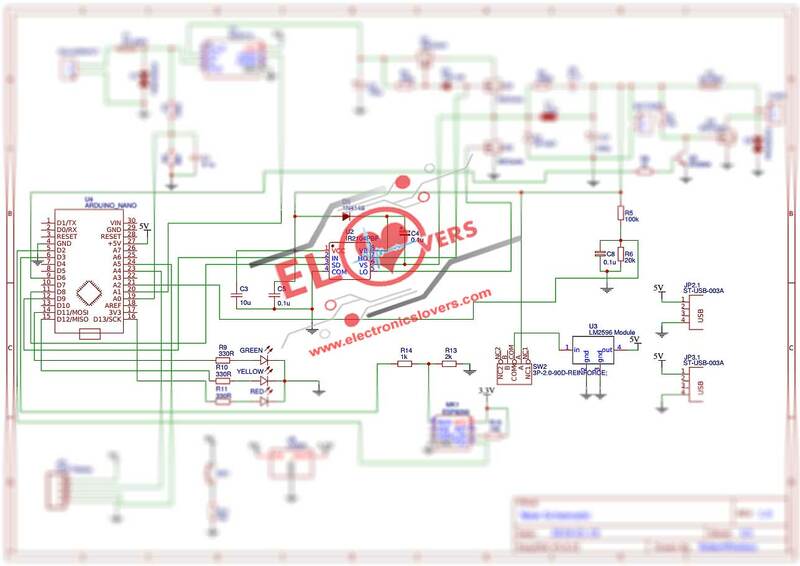 Probably I do not fully understand the schematic but I find two issues. Can you help me? IRFZ44N are N channel Mosfets and Q1 and Q2 are in the high side of the circuit with the source in the positive pole. Aren’t they always on? is this what you want? isn’t it better in this situation a P channel Mosfet? and, when Q3 is on, doesn’t it shortcut the positive pole of the battery to ground? This issue has been resolved By just adding a High ampere Diode at a forward biased direction toward battery input terminal. 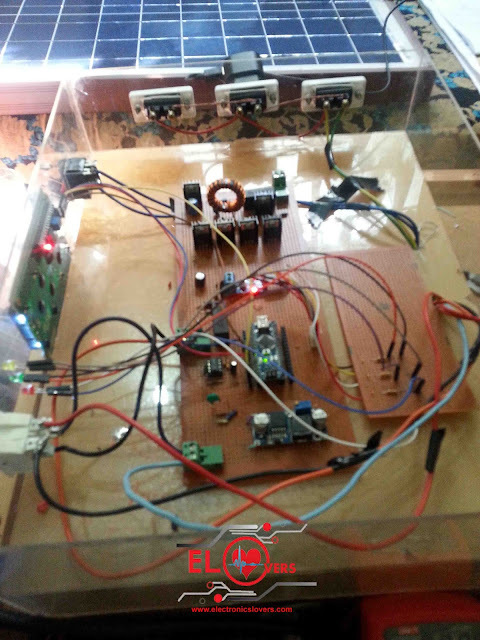 hello sir i am doing project it is like battery should be charged from and solar panel and in night automatically load should get ON and whenever the solar is not charged due to climate problem or rainy season that time it should get charged by an home supply automaticaly . if you help me it will be very help full . 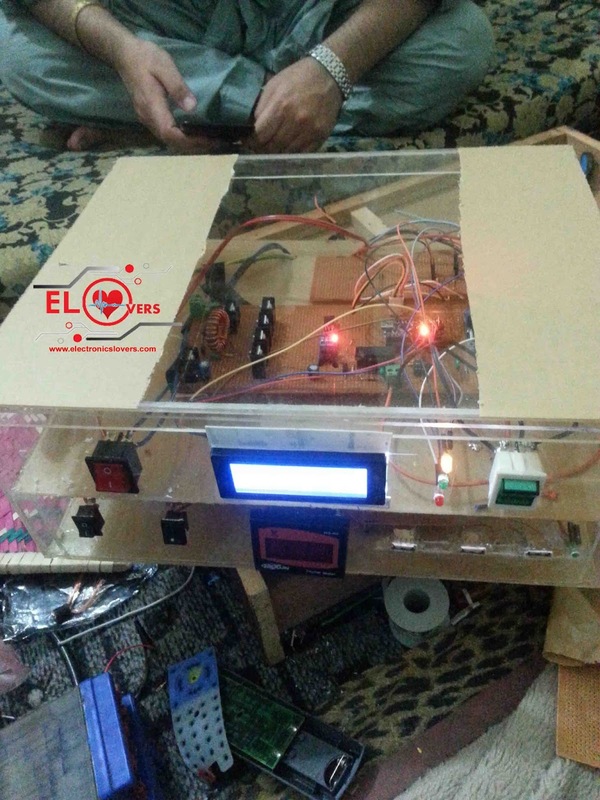 Sir, Iam making the similar project but using the 3watt solar panel inplace of 50watt due to cost of solar panel , can i use the same circuit for 3watt solar panel and my battery is of 12volts? If pv voltage is higher than battery, high-side FET -> Current always flows to the body diode. I think the polarity has changed. Hi, I am Anupam, it is a very interesting project and I would love to construct it because at present I am charging my inverter battery directly from PV panel. Would please kindly give me the code. Further the details of construction of the Inductor is not there which is also required. If I have to write a new code based on my algorithm. Do I Need to make any changes in schematics?